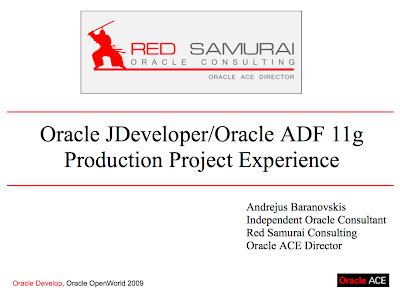 Here you can download presentation slides from my session on OOW'09 - S307721.pdf. Your presentation is great, as I can finally see forms to adf transformation in "real life". Do you have any sample app attached to presentation? I would very much appriciate if you could share it with me. Let me know, if you will need any help. I'm relatively new to ADF and Java world (old fashioned Forms developer) but I'm amased with it and trying to make a "big switch" :). Your blog is definitely the source that makes me "touch" adf, and not only "feel" it, if you know what I mean?!. Hello Andrejus. Im an old fashioned form user and i arrive here searching for information about adf for a project. I have two questions if you can answer me. 1. How much java do you need to know in order to porgramming adf and 2. Is there a special problem with performance or is just the problem you may have with everything? 1. In ADF there are two parts - Model and ViewController. Model is related to database logic, I think its where Forms developers would love to work. ViewController required more Java skills. Generally speaking, you should know ADF related Java API, there is no need to know Java on senior level. 2. Performance is something you may have problem with everything. It depends how user interface is designed as well. You should restrict full table scans and etc. In ADF, if database level performance is good - you dont have problems. But, if you execute long queries in database, you will have problems then. Thank you so much for the quick response. It was useful! Hi Andrejus. How many users did this configuration support? I guess you are asking about concurrent users. This system was deployed on multiple sites, with highest number of concurrent users coming to 500 i think. We are Migrating our project from Oracle forms to ADF using Jdeveloper. For Example:-My Project has 3 modules Master(Include Customer,Item,Supplier,Salesman), Sales & Purchase modules. It contains more than 50 forms. I just go through your slides but i didn't have much explanation about splitting & integeration. Can you just give us explanation or give us sample application how you split them and integerate as single project.